Huawei announces Nova 2 lite pre-order details, will come with a FREE JBL wireless headphones! Home / huawei / mobile / news / Huawei announces Nova 2 lite pre-order details, will come with a FREE JBL wireless headphones! Huawei Mobile just announced that the pre-order details for the new Huawei Nova 2 lite here in the Philippines. 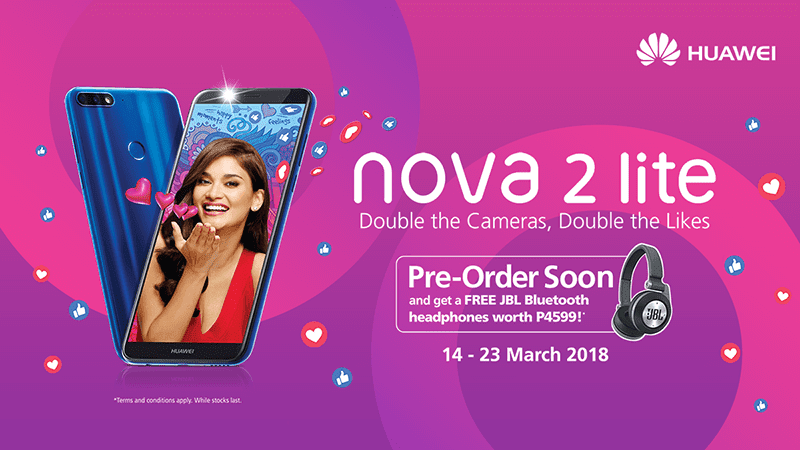 Interested buyers of the new Nova 2 lite may pre-order the said device starting March 14 until March 23, 2018. According to Huawei, the promo is open to all users who will pre-order the Nova 2 lite from all the 47 selected Huawei experience stores, kiosks, and retail stores. To pre-order, the buyer must deposit PHP 1,000 in cash which will be will be deducted on the total amount upon full payment of unit on redemption date. In addition, Huawei will throw away a FREE JBL E40BT headphone worth PHP 4,500 for those who will pre-order the Nova 2 lite. Redemption period will be on March 24, 2018. Huawei also noted that only those who will pre-order will be eligible for the JBL E40BT headphone freebie. Those who will walk-in will get a different freebie. For more info, kindly visit this link now.